Ichikawa Monnosuke IV as the mother, and Onoe Matsusuke as her shop-boy son. 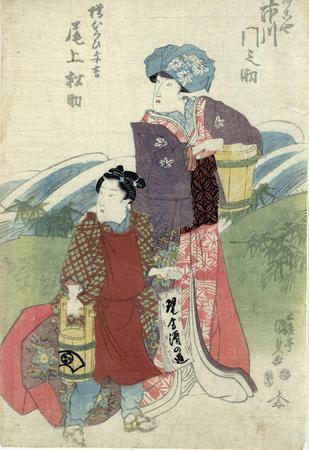 This print commemorates a performance of Ise heishi ume no Mitegura at the Kawarazaki-za in 11/1820, as identified by the Victoria and Albert Museum. In an older play, Dan no Ura Kabuto Gunki, Akoya is the mistress of Kagekiyo. This appears to be a more modern rendition of that play.